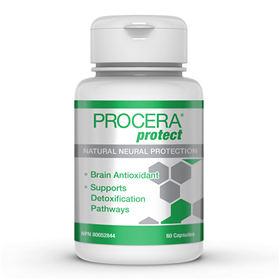 Procera Protect is a natural brain detoxifier that can help neutralize neurotoxic buildup in the brain. Brain antioxidant protection from free radicals, neurotoxins, stress and aging. Toxins levy a heavy tax on all of our organs, but they are particularly devastating to the brain where they can be more concentrated. Procera Protect is a natural chelator. What does that mean? Chelation is a process in which an ingredient can bind to, draw out, and eliminate another molecule in the body, including toxins like iron, lead or mercury. However, many synthetic chelating agents are harsh on the body and may be problematic for aging individuals or those who have immune system vulnerabilities. Procera Protect’s natural formula eliminates that worry. Composed of highly researched food and herbal extracts that are considered safe and effective—such as curcumin, resveratrol and quercetin—Procera Protect helps gather up brain toxins and remove them in a softer, kinder way. Procera Protect’s neuroprotective benefits also make it an excellent complementary companion to Procera AVH. Procera Protect is our signature BRAIN REPLENISH AND RESTORE product for brain detoxification. Procera Protect® delivers the 6 top natural ingredients that help protect and detoxify the brain. Alpha Lipoic Acid (ALA) is thought to be one of the secrets behind the brain-boosting effects of spinach. It is a powerful antioxidant that promotes other neuroprotective, antioxidant agents, such as Vitamins C and E, as well as CoQ10. ALA works synergistically with aceyl-l-carnitine (ALC), one of key active ingredients in Procera AVH®. It also enhances the action of ALC in the mitochondria where together they synergistically boost levels, while fighting free radicals. ALA also helps boost levels of glutathione, one of the brain’s most important antioxidants and immune boosters. And ALA helps balance glucose metabolism—supporting glucose tolerance, a key factor for a healthy brain and cognitive performance. Curcumin (CUR) is a bright orange yellow polyphenol found in the spice turmeric that activates detoxification enzymes. In addition to its neuroprotective qualities, it helps chelate heavy metals such as iron and lead from the brain. MethylCobalamin (MCB) is the most brain active form of Vitamin B-12, which helps lower brain harmful levels of homocysteine. Vitamin B-12, which is only found in adequate amounts in shellfish, beef, and liver, is required for proper neurological function. MCB promotes the repair of damaged neural tissue that results from normal aging, lifestyle excesses, and free radical damage. N-Acetyl-Cysteine (NAC) is an amino acid and a powerful neuroprotective and detoxifying agent that also works at the mitochondrial level. NAC, along with Alpha Lipoic Acid, also helps increase glutathione, the body’s most powerful immune system enhancer. Quercetin (QURC) is a dietary flavonoid found in many plants, including tea, apples, onions, ginkgo biloba and citrus, and is considered one of the best neuroprotective molecules found in nature. QURC is believed to be the most active of the flavonoids, and many medicinal plants owe much of their healing abilities to their high QURC content. QURC has been shown to promote potent antioxidant activities, while boosting the effectiveness of Vitamin C.
Resveratrol (RES) is a potent antioxidant and phytochemical found in more than 70 plants, including dark skinned grapes, berries, and certain herbs. True CBD Hemp Oil 1 oz 2200 mg.